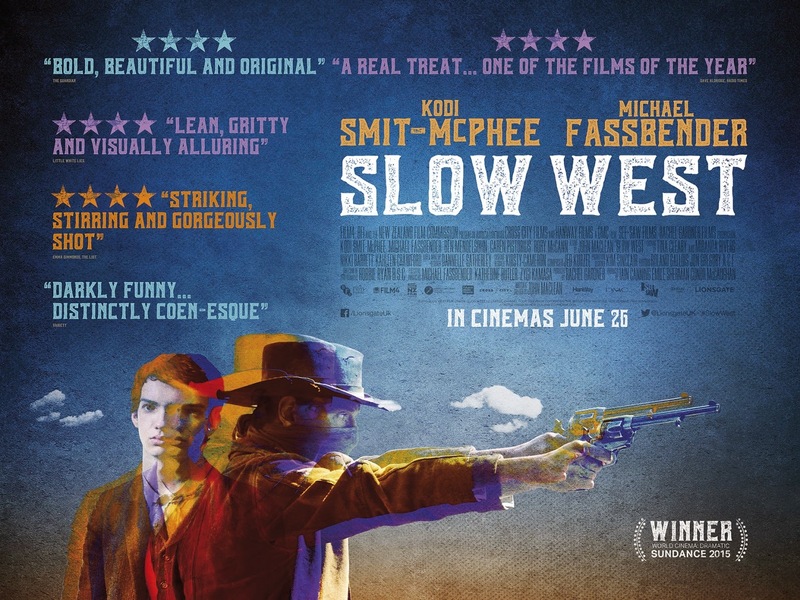 This combines a romantic melodrama with a brother-goes-bad story, all set in post-Civil War carpetbag Texas. The central question is: What will happen when a respectable man discovers his new wife’s sordid past? Capt. Colt Saunders, a former Confederate cavalry officer, is returning to the family ranch in southern Texas after the war. He sees the oppression by the carpetbaggers but is careful not to get involved himself, until he notes a well-dressed woman about to be manhandled when she tries to alight from a stagecoach. The woman is Lorna Hunter (Anne Baxter), and in the ensuing fight Saunders is knocked unconscious. Lorna puts him in a hotel room and makes off with $900 she finds on his person, but on second thought she has it put in the hotel safe with a receipt made out to Saunders. It turns out the hotel and its related saloon are run by her old (and shady) friend Ruby LaSalle (Elaine Stritch), who disapproves of whatever game Lorna’s playing with Saunders. Early Days: Lorna Hunter (Anne Baxter) and Colt Saunders (Charlton Heston) get to know each other. When he wakes up, Saunders is taken enough with Lorna to marry her impulsively on the spur of the moment. Arriviing at the Saunders Bar S ranch founded by Saunders’ grandfather, they find that (a) it has been kept running by foreman, gunman and resident sage Innocencio Ortega (Gilbert Roland) and his five sons, (b) the carpetbag government has taken virtually all the Saunders cattle, leaving them only a hidden horse herd, and (c) Saunders’ one-armed black sheep brother Beauregard “Cinch” Saunders (Tom Tryon) has returned to complicate everything else. 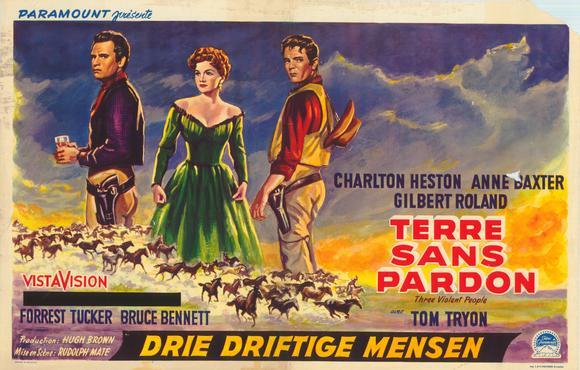 Saunders and Lorna go off to visit a neighbor, where instead they find the local carpetbag Tax Commissioner (Bruce Bennett) and his minions, including Cable (Forrest Tucker), a gunfighter. One of the minions recognizes Lorna from St. Louis, where as a member of Gen. Benjamin “Beast” Butler’s staff he had once frolicked with her during the war. It’s a bad way for Saunders to find out, and he doesn’t take it well. Against Ortega’s advice, he orders her to leave while he’s off on an extended tour of the ranch. 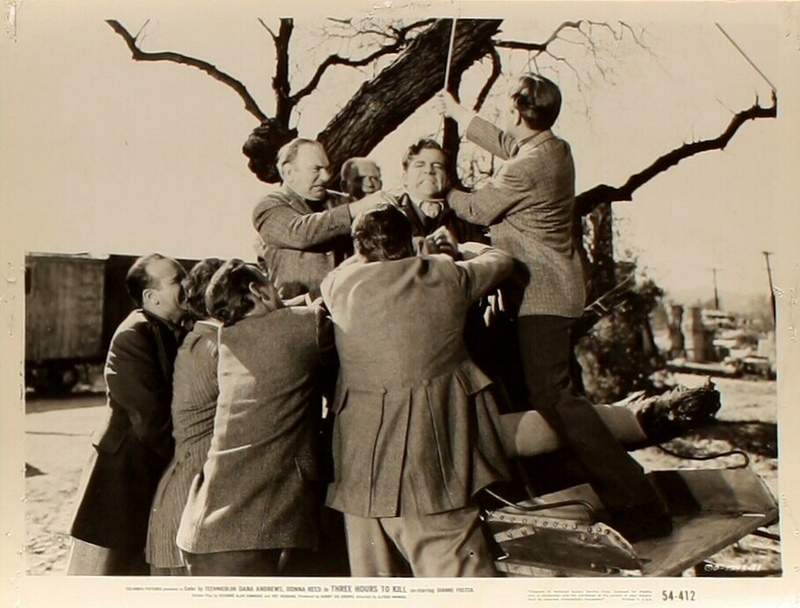 Carpetbagging gunslinger Cable (Forrest Tucker) gets what he wants. Thinking better of it, especially when he learns that Lorna is pregnant, he heads back to ranch headquarters early, only to find that Cinch has persuaded Lorna to help him make off with the remaining Saunders horses, which they plan to sell for $30,000. 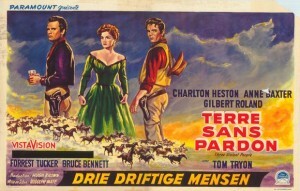 With the help of Ortega and his sons, Saunders recaptures the herd and takes the horses and Lorna back to the ranch, at least until the baby is born. Ortega decides he must leave in the face of such stupidity. Cinch Saunders has been banned from the ranch for his perfidy, but he schemes with the carpetbaggers to take over the Saunders ranch, even as Texas’ carpetbag government is falling apart. 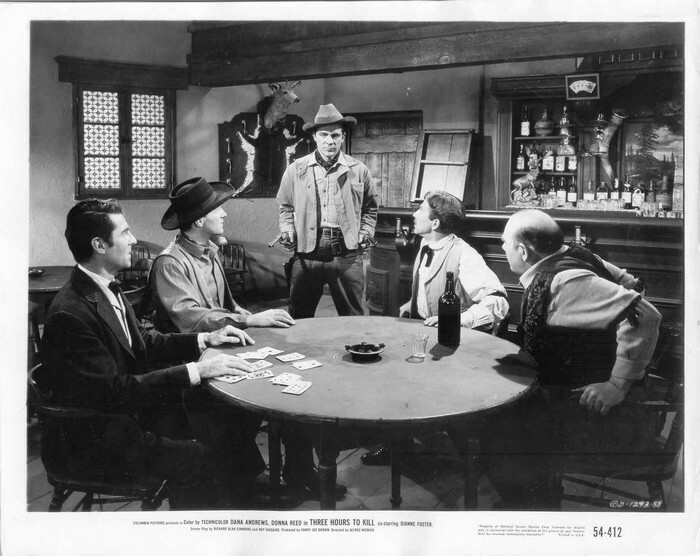 Hard-headed Colt Saunders (Charlton Heston) negotiates with his brother Cinch, with his wife Lorna, and with carpetbaggers. The baby is born, and Lorna prepares to leave as Saunders had demanded. Cinch shows up to take over but is double-crossed by the Commissioner and Cable, who plan to leave no witnesses to their shady dealings. He redeems himself by taking out Cable at the cost of getting shot himself, while Saunders, Ortega and the Ortega sons kill the Commissioner and drive off the other nefarious carpetbaggers. Cinch dies nobly, and Lorna and Colt Saunders are apparently back together. And Ortega and his sons (one of whom is played by Robert Blake) decide to stay. Charlton Heston was hitting the peak of his career, having just finished as Moses in The Ten Commandments (1956, not yet released at the time this was filming) and coming up as Steve Leech in The Big Country (1958) and Judah Ben-Hur in Ben-Hur (1959). He manages to convey the competence and implacability of Colt Saunders, although this is not on the scale of those three big productions. Anne Baxter is good as a woman with a past (The Spoilers , Cimarron  and even The Ten Commandments). And Gilbert Roland, who had been in movies since the silent era of the 1920s, played this kind of role—a polished Hispanic man of the world, good with a gun—better than anybody else, although here he verges on a stereotype. On the whole, this feels a little overheated to current audiences, but melodramas are no longer fashionable in movies. It’s quite watchable, although you wish the characters (except for Roland, who talks a lot) would talk to each other more, and that there was a little more subtlety in the relationship between Colt and Lorna Saunders. 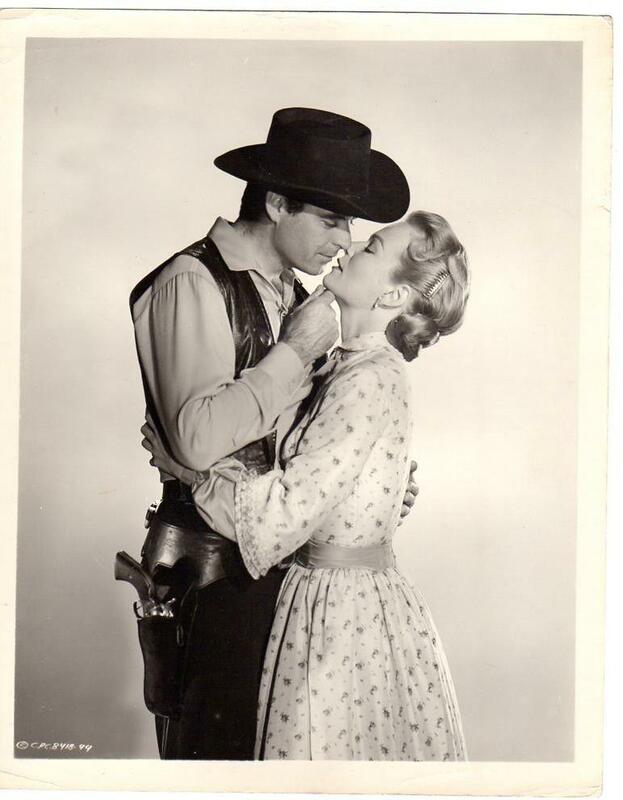 Tom Tryon as bitter one-armed brother Cinch is too much a one-note character. It would be good if glimmers of something other than the bitterness were shown. Some of the names (Colt? Cinch? Beauregard?) are a bit of a problem. 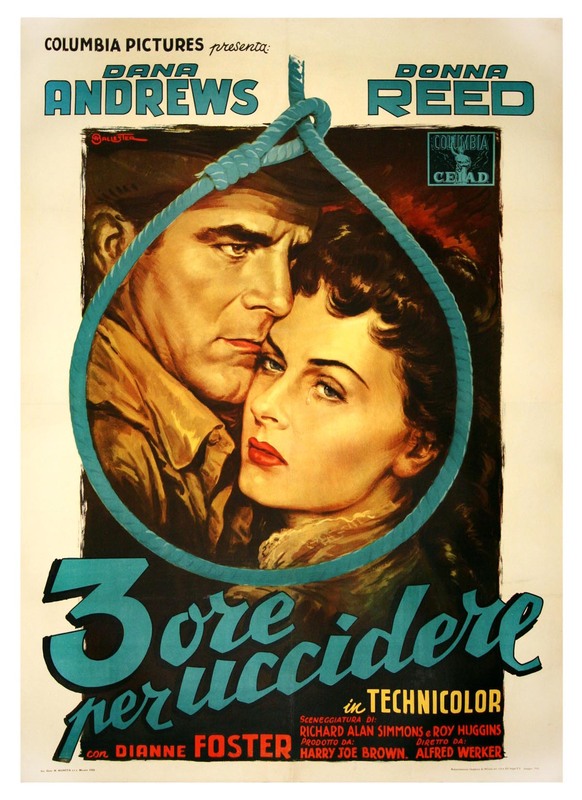 Rudolph Maté, who had started as a cinematographer in Europe in the early 1920s, was an experienced director of westerns (The Rawhide Years, The Far Horizons, The Violent Men). 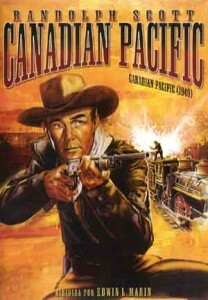 The screenplay was by James Edward Grant, a favorite of John Ford and John Wayne. Shot in color in and around Old Tucson, Arizona, by Loyal Griggs, at 100 minutes. It’s not entirely clear who the three violent people are (there would seem to be more than three), but they’re probably Colt Saunders, Cinch Saunders and Innocencio Ortega. Maybe including Lorna Saunders, since the title isn’t limited to men. 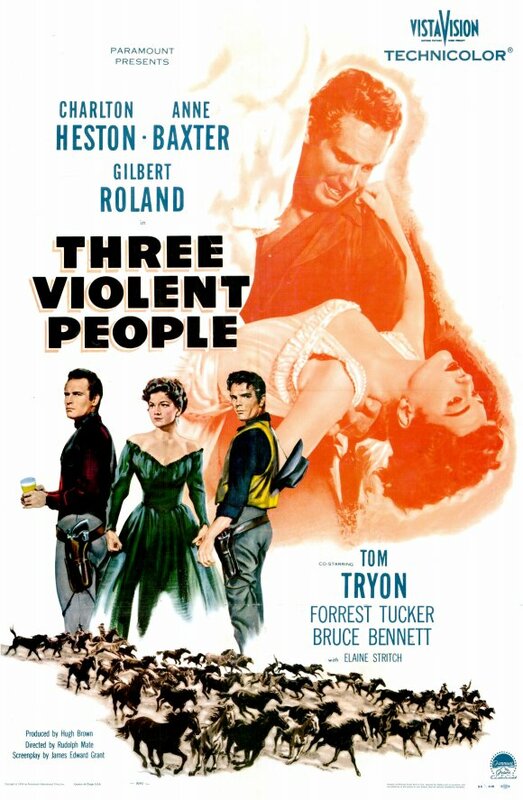 Not to be confused with Maté’s The Violent Men (1955), with Glenn Ford, Edward G. Robinson, Barbara Stanwyck and Brian Keith. 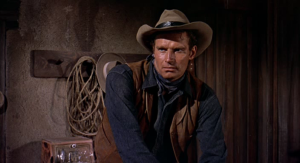 For Charlton Heston in better westerns, see him in the sprawling The Big Country (1958) with Gregory Peck and Burl Ives and in the excellent character study Will Penny (1968). Gilbert Roland shows up in Anthony Mann‘s The Furies (1950) with Barbara Stanwyck, Bandido (1956) with Robert Mitchum and as a noble Cheyenne chief in John Ford‘s last film Cheyenne Autumn (1964). 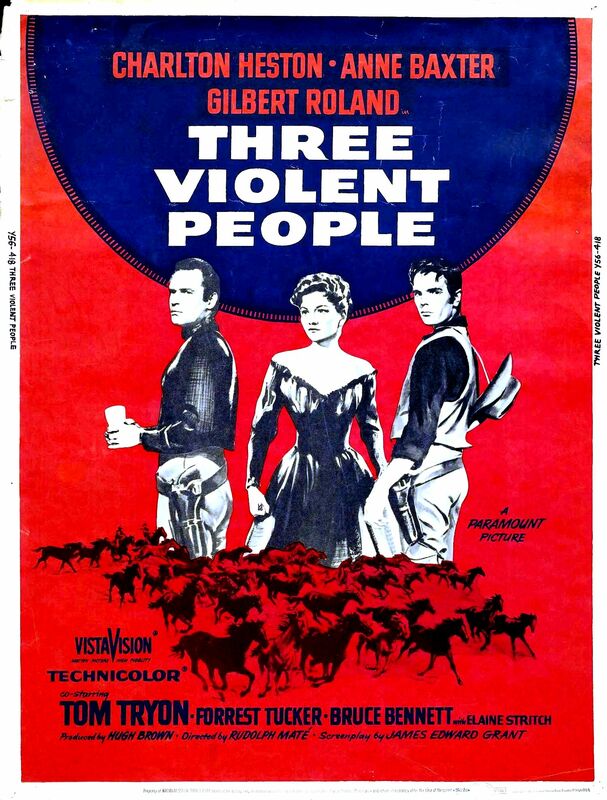 This entry was posted in Westerns Worth Watching and tagged Charlton Heston, Civil War Aftermath, Range Melodramas on May 28, 2015 by Nicholas Chennault. Audrey Hepburn was an elegant and accomplished actress, but seemingly not a natural in westerns—more a creature of the modern world, with a very slight and vaguely European accent. This was her only western, and she has kind of a peripheral role, although a controversy about her is the central conflict of the movie. In fact, she is not well cast here for what her character is supposed to be. 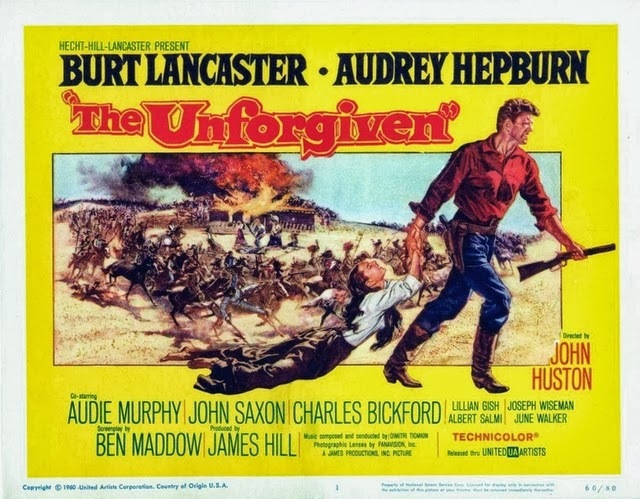 In addition to Hepburn, there is a lot of top talent involved here: director John Huston, writer Alan LeMay (known for The Searchers), big star Burt Lancaster, and western star Audie Murphy. The movie opens with an interesting shot of cattle grazing on the sod roof of the Zacharys’ ranch house in the Texas panhandle in the years immediately after the Civil War. The family patriarch, Will Zachary, had been killed by Kiowas several years previously, and because of the long conflict with the Kiowas many whites, including middle brother Cash Zachary (Audie Murphy), hate Indians. The Zacharys are partners of a sort in a ranching venture with the Rawlins family headed by Zeb Rawlins (crusty Charles Bickford), left crippled by Kiowa torture some years previously. Sister Rachel (Audrey Hepburn) and brother Ben Zachary (Burt Lancaster) riding together. The head of the Zachary family now is oldest brother Ben Zachary (Burt Lancaster), first seen returning from Wichita with newly-hired hands to make the long drive back to Wichita with the combined Zachary-Rawlins herd. The proceeds should make both families financially secure for the first time. 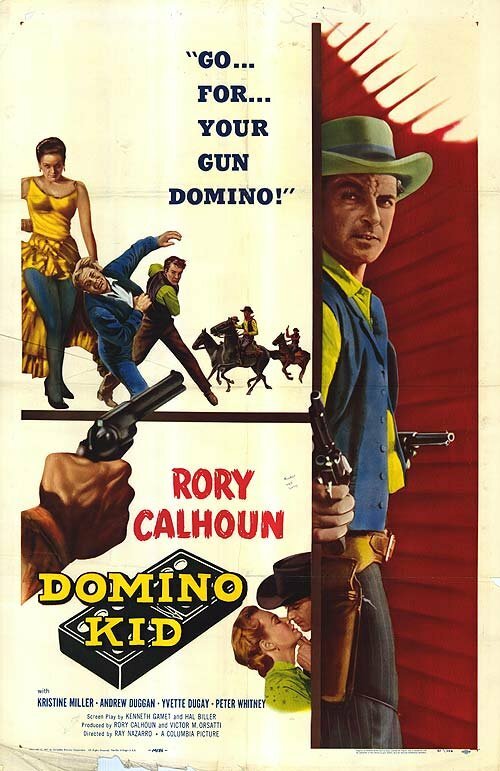 Brother Cash Zachary is good with a gun but hot-headed; youngest brother Andy Zachary is just inexperienced; and sister Rachel Zachary (Audrey Hepburn in dark makeup) is a foundling adopted by the family a couple of decades earlier. 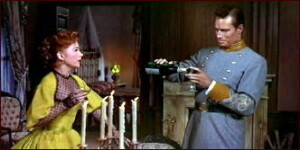 Early in the movie, Rachel encounters a mysterious older figure dressed what appear to be parts of a Confederate uniform, carrying a saber. He is Abe Kelsey (Joseph Wiseman), who makes cryptic quasi-Biblical pronouncements and may be crazy. Ma Zachary (Lilian Gish in her second Texas matriarch role, after Duel in the Sun more than ten years earlier) clearly feels threatened by him. Ben and Cash give chase, and, although they do not catch Kelsey, they kill his horse. Abe Kelsey (Joseph Wiseman), who may be crazy, stirs up old wounds. Meanwhile, young Charlie Rawlins (Albert Salmi, who tended to play thugs or clods—here he’s a clod) is interested in Rachel, although Ben doesn’t seem very enthusiastic about Charlie’s romantic attentions to his (non-genetic) sister. 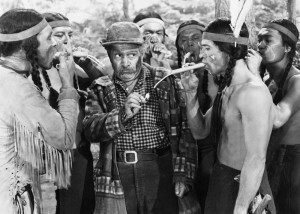 Kiowas show up, claiming that Abe Kelsey has told them that Rachel is an abducted Kiowa and sister to the Kiowa leader. As Ben rejects the Kiowa overtures, they respond by killing Charlie Rawlins. A clearly distraught Ma Rawlins reacts by claiming to believe the Kiowa story, and the Rawlinses threaten to pull out of their partnership with the Zacharys if the story is true. 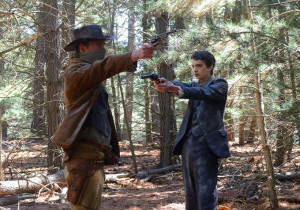 A combined force of Zachary and Rawlins men hunts down Abe Kelsey when he steals Rachel’s horse. Under interrogation at the Rawlins ranch, he says that when his own son was captured by the Kiowas years before, he had wanted to trade young Rachel for his son and the Zacharys had refused. As Kelsey sits on a horse with a noose around his neck, Ma Zachary kicks his horse and he hangs. Oldest brother Ben Zachary (Burt Lancaster) negotiates with the Kiowas. [Spoilers follow.] Back at the Zachary ranch, Ma Zachary admits that when Will Zachary returned from a settler raid on a Kiowa village a couple of decades earlier, the only survivor was an infant girl, who was then adopted by the Zacharys in the place of their recently–deceased baby girl. That was Rachel. Cash is having none of it and leaves in a rage. The Zacharys find themselves besieged by Kiowas and hold out for a day under the leadership of Ben. Ma is shot and dies because she doesn’t tell anybody about her wound. The next day, the Kiowas drive the Zachary cattle onto the top of their house, causing the roof to collapse. Cash returns with ammunition just in time and kills several Kiowas but is wounded a couple of times himself. 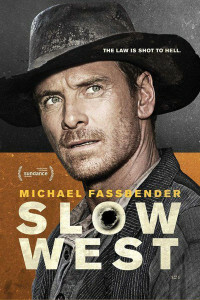 Rachel, with only a few rounds in a pistol, is confronted by her Kiowa brother and has to choose between the only family she has known or her Indian heritage. 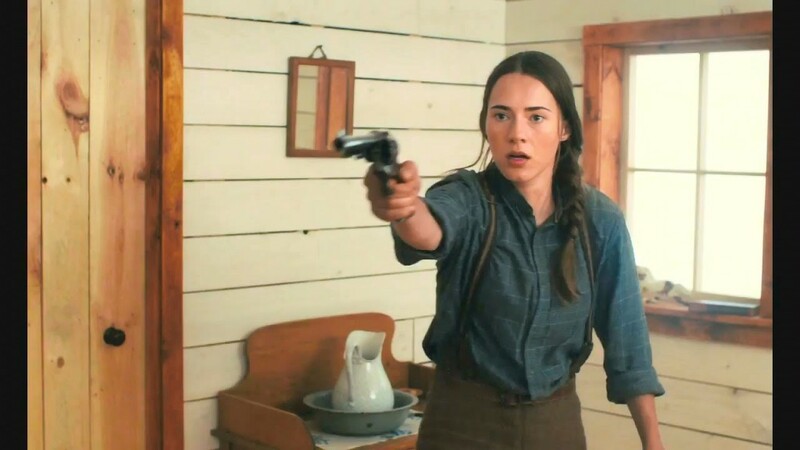 She shoots the Kiowa brother. 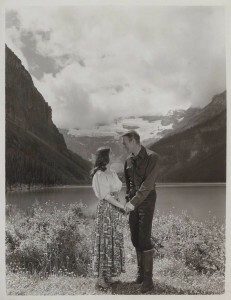 At the end, with their ranch in ruins, the latent romance between Ben and Rachel comes out, and they decide to get married. This is a typical sort of John Huston movie, with dark secrets from the past influencing or controlling the present. Burt Lancaster is a strong lead, seldom wearing a hat during the entire movie so his vigorous growth of hair is always on display. 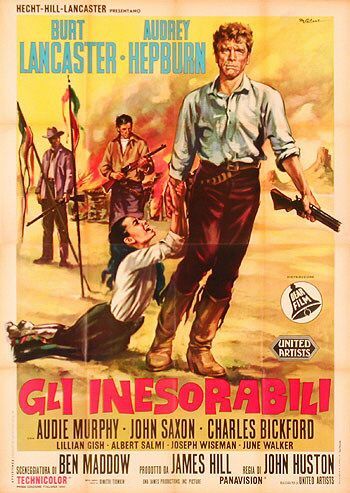 Audie Murphy is perfectly adequate in one of his few A westerns (along with Night Passage). Lilian Gish is good at being a frontier matriarch haunted by the dark past. 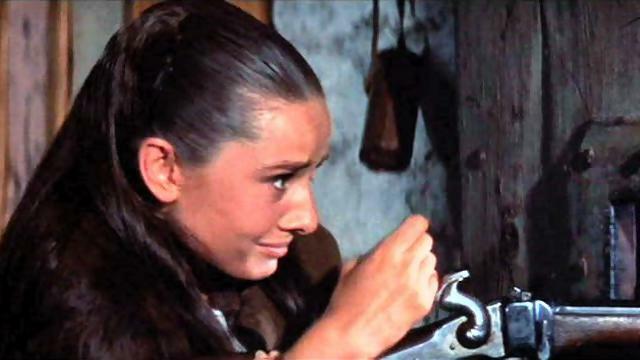 Audrey Hepburn doesn’t look much like an Indian despite her dark makeup, and she has an unusually refined persona for any kind of frontier woman. Preparing to receive the Kiowas: Rachel (Audrey Hepburn, in her dark makeup) with her frontier skills. Huston saw this as a story about racial relations and bigotry; the studio wanted to make sure that it was primarily commercial, and the two concepts do not always make for a comfortable mix. Some of the dialogue and references to Indians (they are continually referred to as “red-hide Indians” and worse) seems a bit virulent for modern tastes. It has some themes in common with John Ford’s The Searchers, although in this case it’s an Indian child abducted by whites and not the other way around. Big budget or not, this is watchable but seems somewhat overheated. Music is by Dimitri Tiomkin and cinematography by Franz Planer. 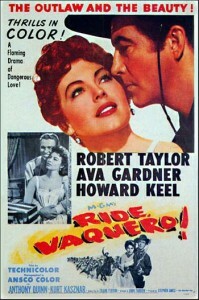 Filmed in color in Durango, Mexico, at 125 minutes. 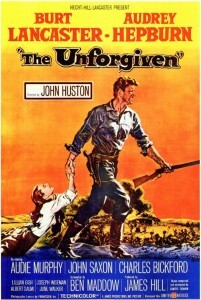 Not to be confused with Clint Eastwood’s 1992 masterpiece Unforgiven. 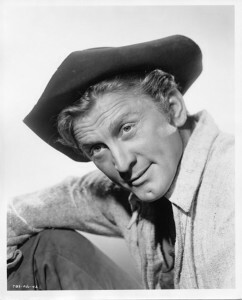 Lancaster’s production company was behind the film, and he initially saw Kirk Douglas in the role of his brother Cash. That idea was shot down because it was thought that Douglas would alter the balances between the brothers as written in the story. When it was decided not to use Douglas, Tony Curtis and then Richard Burton were considered for the role before Audie Murphy was ultimately chosen. Bette Davis turned down the Lilian Gish role because she didn’t want to play Burt Lancaster’s mother. 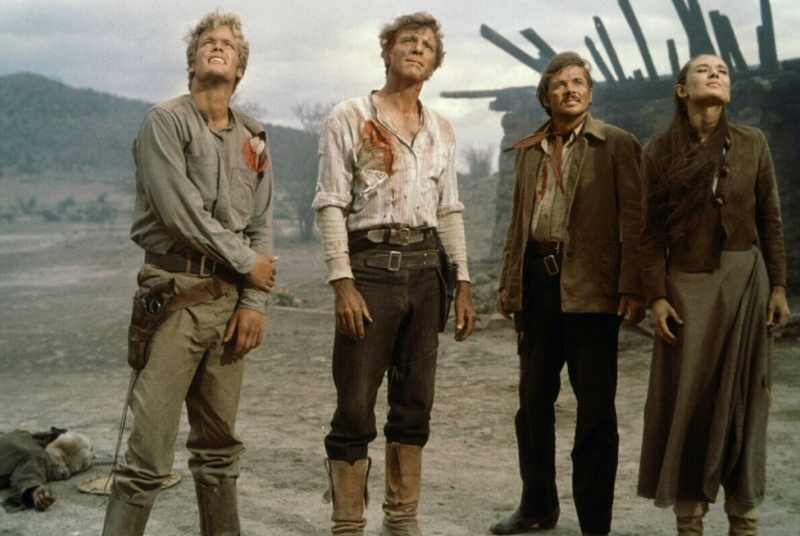 The surviving Zacharys: Andy (Doug McClure), Ben (Burt Lancaster), Cash (Audie Murphy) and Rachel (Audrey Hepburn). Before filming began, director Huston and Lancaster took Lillian Gish out to the desert to teach her how to shoot, which she would have to do in the film. 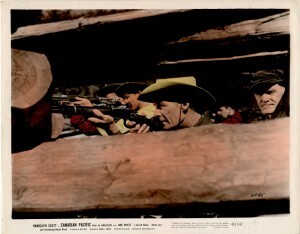 However, Huston was surprised to discover that Gish could shoot faster and more accurately than either he or Lancaster, who both thought themselves expert marksmen. It turned out that early in her career during the silent movie era, Gish was taught how to shoot by Oklahoma outlaw Al Jennings, who had become an actor after his release from a long prison sentence for train robbery and was cast in one of her films. She found that she liked shooting and over the years had developed into an expert shot. Audrey Hepburn was seriously injured during production when she was thrown by a horse between scenes. Hepburn, who was pregnant, spent six weeks in the hospital healing from a broken back and, when she returned to the set, was able to complete her role wearing a back brace, which her wardrobe had to be redesigned to hide. Sadly, she suffered a miscarriage a few months later, which some blamed on her injury from this movie. 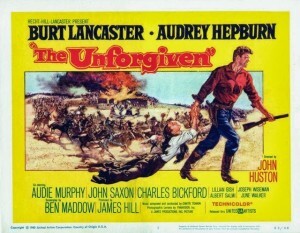 Indeed, John Huston blamed himself for the mishap, although Hepburn harbored no ill feelings toward the director. While Hepburn was in the hospital, Huston filmed scenes using a double. Of course, it didn’t help Hepburn’s health that her weight fell to 98 pounds during filming, and that she increased her smoking to three packs a day. 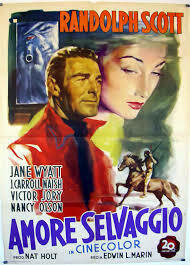 In his autobiography, John Huston describes this film as the only one he ever made that he entirely disliked. 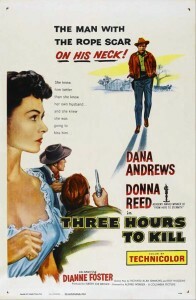 Film critic David Thomson, not usually a Huston admirer, called it his best film. It pretty clearly is not: The Maltese Falcon, Key Largo, The Treasure of the Sierra Madre, The Asphalt Jungle, The African Queen and The Man Who Would Be King all have stronger claims to that honor. This entry was posted in Westerns Worth Watching and tagged Audie Murphy, Burt Lancaster, Native Americans (Indians) on May 18, 2015 by Nicholas Chennault. Here we continue with our ranking of the top actors in westerns since 1939. For the top ten such actors, see our posts Shooting Stars Part 1 and Shooting Stars Part 2. 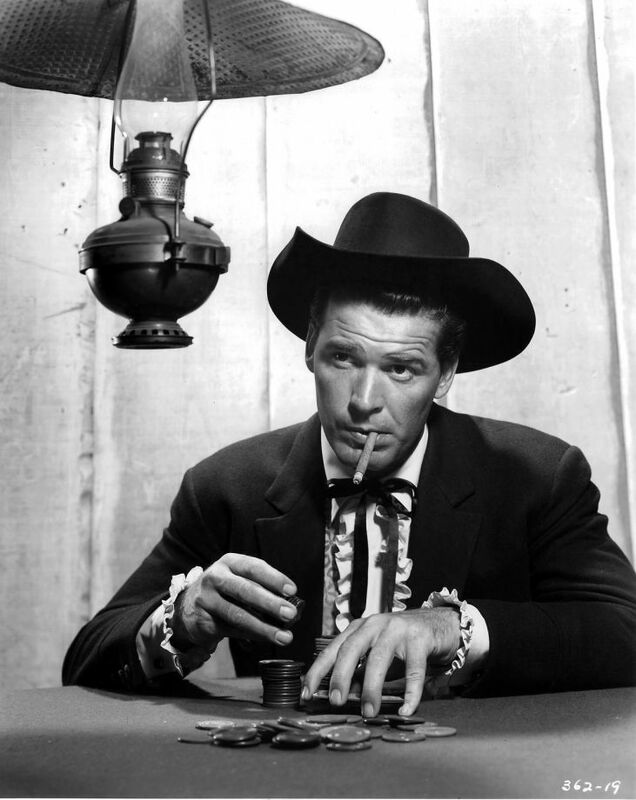 Oklahoma native James Garner is best known for his roles as an amiable western con-man, first demonstrated in the Maverick television series of the late 1950s. He was better at that kind of role than anybody else (see Support Your Local Sheriff, Skin Game and Support Your Local Gunfighter). He successfully played variants of that role in movies set in more modern times, including a couple of good ones set in World War II (The Great Escape  and The Americanization of Emily ) and a number of 1960s romantic comedies (Boys’ Night Out with Kim Novak, Cash McCall with Natalie Wood, The Thrill of It All and Move Over, Darling, both with Doris Day). But that wasn’t the limit of his talents. He could also do well at a kind of grim, humorless role, as he showed in Duel at Diablo (1966) and while playing Wyatt Earp in John Sturges’ Hour of the Gun (1967). It was his misfortune that mainstream westerns were starting to decline in popularity when he was at his peak, and by the mid-1970s he was showing up in light, Disney-produced westerns with Vera Miles that haven’t been much seen (The Castaway Cowboy, One Little Indian). More successful was his venture back into television as private detective Jim Rockford in The Rockford Files (for six seasons, starting in 1974). 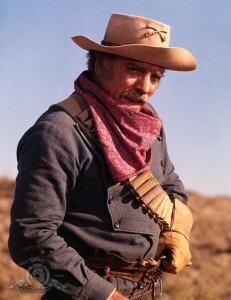 In the later stages of his career, he was very good in a modern romantic western with Sally Field in Murphy’s Romance (1985), for which he was nominated for an Academy Award and a Golden Globe. He showed up in two more westerns, once again as an aging Wyatt Earp in Hollywood of the late 1920s in Sunset (1988), and in the Mel Gibson Maverick remake (1994). 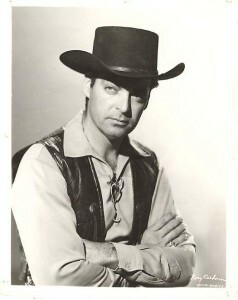 He returned to television with a short-lived series reprising his original Maverick character in Bret Maverick (1981) and with a credible turn playing an aging Capt. 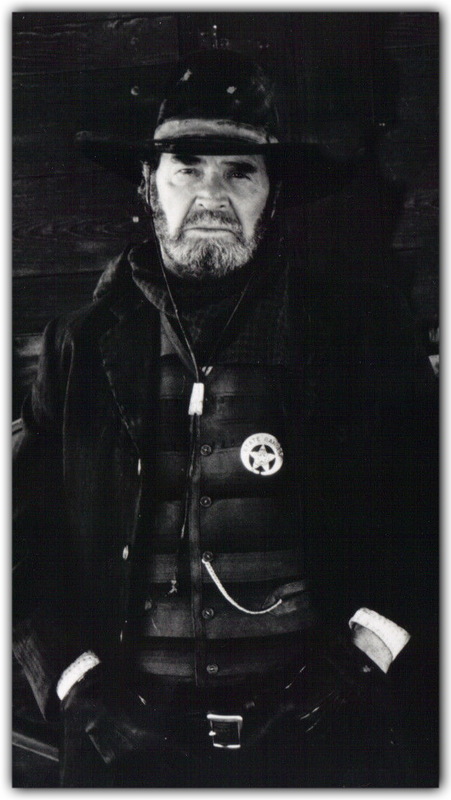 Woodrow Call in the television miniseries The Streets of Laredo (1995), based on a sequel to Larry McMurtry’s Lonesome Dove. (One story has it that he had been offered the role of either Woodrow Call or Gus McCrae–his choice–in the original Lonesome Dove miniseries but was sidelined by health problems. Lonesome Dove, of course, went on to become a classic with Tommy Lee Jones and Robert Duvall in those roles.) An interesting sidelight of his late career was to see him together with fellow westerns star Clint Eastwood as aging astronauts in Space Cowboys (2000). Like Paul Newman and Steve McQueen, Garner was long interested in automobile racing. He was a good enough driver that he did his own driving stunts in The Rockford Files because he was better at it than any stuntman they could find. In a 1973 interview, John Wayne called James Garner the best American actor. Of all his films, The Americanization of Emily, with Julie Andrews (1964), was said to be Garner’s favorite—an excellent movie, wonderfully written and superbly acted but unfortunately not a western. 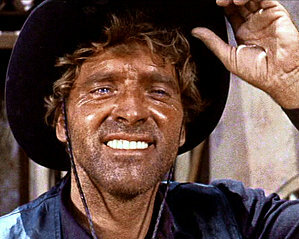 Burt Lancaster was one of the biggest movie stars of his time, from the late 1940s well into the 1970s. Known especially for a vigorous brand of physical athleticism (he had once been a circus acrobat), an equally vigorous growth of hair and a large grin showing off a full set of very white teeth, he was willing to take any role that interested him. He won an Academy Award as Best Actor for his performance in Elmer Gantry (1960). For an early performance in a western, see him as the grinning unscrupulous quasi-outlaw Joe Erin in Vera Cruz (1954), playing with and against the more traditional and stolid Gary Cooper. 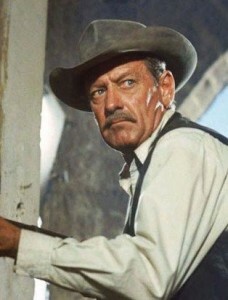 One of many to play Wyatt Earp, he did a credible version in John Sturges’ Gunfight at the OK Corral (1957), and he could also play a certain kind of comedy convincingly (The Hallelujah Trail , The Scalphunters ). He was not afraid of taking a role secondary to lesser star Lee Marvin in The Professionals (1966), and his strong performance alongside Marvin made for an excellent western. By the 1970s, as westerns faded in popularity as a cinematic genre, Lancaster was doing some of his strongest work in westerns as old scout Bob Valdez in Valdez Is Coming (1971) and as old scout Archie McIntosh in Ulzana’s Raid (1972), probably the last really good cavalry movie. He’s even good as the central figure in the revisionist Lawman (1971) with Robert Ryan, which otherwise has some problems with its writing and direction. 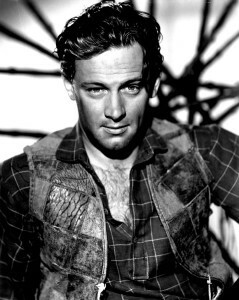 Gregory Peck shared Joel McCrea’s ability to project a basic American style of decency, although his brand of that quality was a little flintier and less self-effacing than McCrea’s. His ultimate cinematic expression of that quality is probably as southern lawyer Atticus Finch in To Kill a Mockingbird (1962). 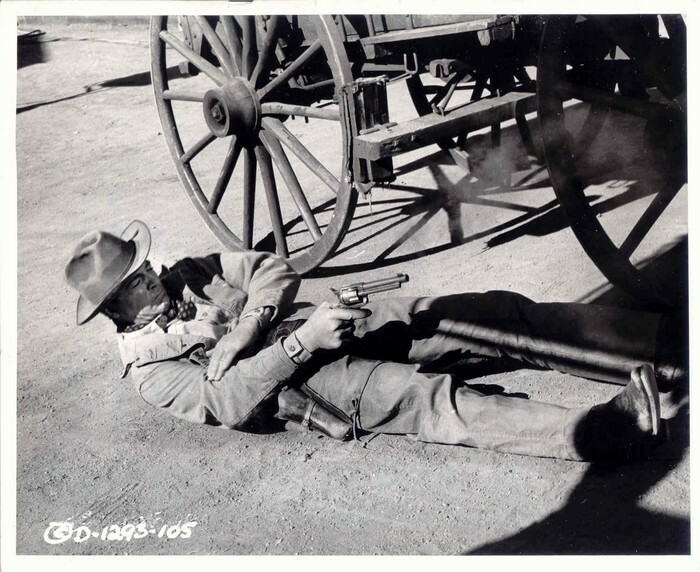 It made him convincing in playing reforming outlaws (Yellow Sky , The Gunfighter ), but less so in portraying bad guys (Duel in the Sun, 1947). 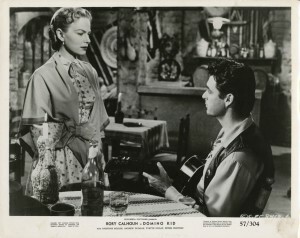 He was a big star, both comfortable and convincing at the center of a large-budget production (The Big Country ). He didn’t make many westerns in the 1960s, part of his period of greatest stardom—only appearing in How the West Was Won (1962), as one among many stars. 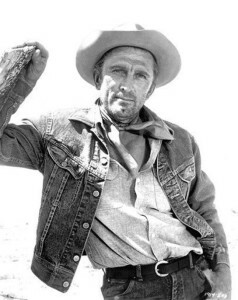 Toward the end of the decade he appeared in a fairly good western thriller (The Stalking Moon ), but like others he didn’t fare well as the genre, and his career generally, moved into a twilight period. He showed up in such turkeys as Mackenna’s Gold (1969) and Billy Two Hats (1974). 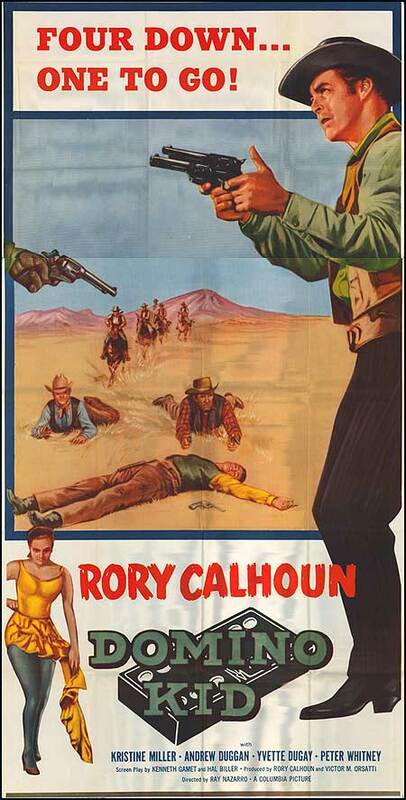 Shoot Out (1971), which is watchable but not remarkable, is probably his best western from this period. In his last western, he starred as crusty writer Ambrose Bierce, the titular character in The Old Gringo, during the period of Mexican revolutions in the 1910s, with Jane Fonda (1989). 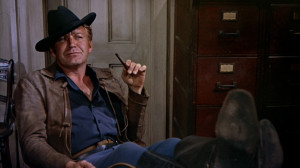 He is justly praised for The Gunfighter and The Big Country; Yellow Sky and The Bravados are probably the most underrated of the westerns in which Peck appeared. Like Burt Lancaster and Gregory Peck, William Holden is not remembered first for his westerns. He is remembered first for his roles as the young writer found floating face down in a swimming pool in Billy Wilder’s Sunset Boulevard, and for Wilder’s World War II drama Stalag 17, for which he won his Best Actor Oscar. But his slightly acid modern-seeming persona translated well enough to westerns if the material and directing were right. 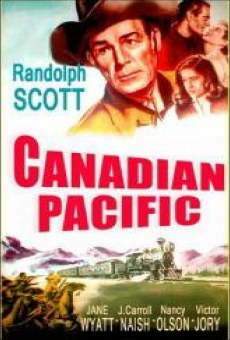 He starred in them from his earliest days in the movies, beginning before World War II with Arizona, with Jean Arthur and Edgar Buchanan (1940), and Texas, with Glenn Ford and Edgar Buchanan (1941). 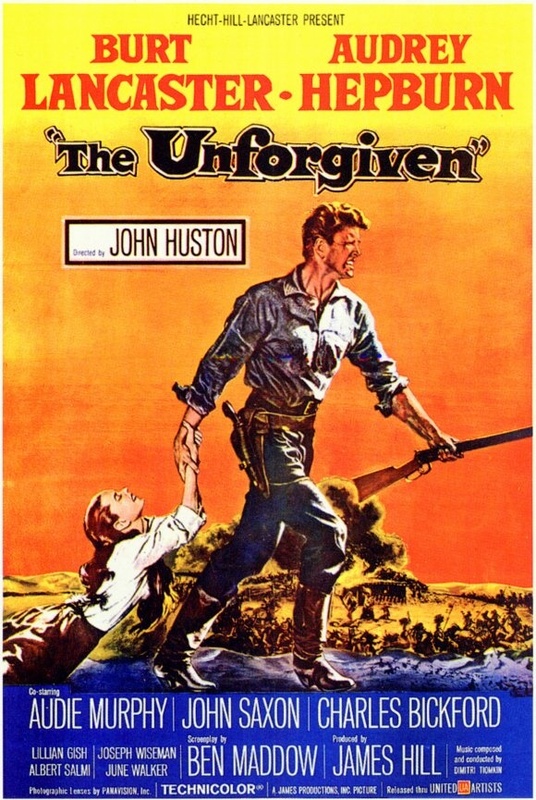 After service in the war, he resumed his film career generally, and westerns specifically, with such good films as The Man from Colorado, again with Glenn Ford (1948) and with the colonial western Rachel and the Stranger, with Loretta Young and Robert Mitchum (1948). 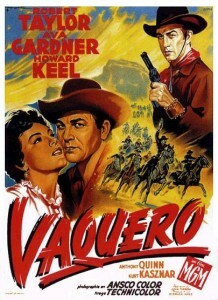 Even with his success and elevation to stardom with Sunset Boulevard and Stalag 17, he made the occasional good western during the 1950s, working with director John Sturges in the underrated Escape from Fort Bravo (1953) and with John Ford in the Civil War cavalry story The Horse Soldiers, playing an army doctor continually feuding with John Wayne (1959). 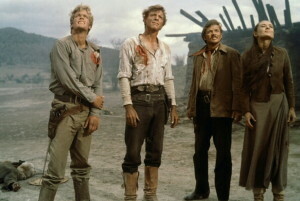 Even as Holden’s alcoholism took its toll on him, Holden’s work in the 1960s included the good Civil War story Alvarez Kelly, with Richard Widmark (1966), and the western for which he is best remembered now: Sam Peckinpah’s landmark The Wild Bunch (1969), in which Holden very effectively plays Pike Bishop, leader of an aging outlaw gang trying to pull off a last job amid the Mexican revolutions of the 1910s. 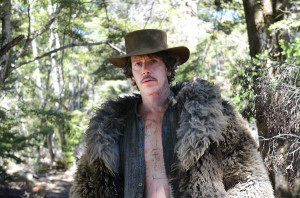 His career in westerns ended on an ignominious note with The Wild Rovers (1971), although the seldom-seen The Revengers (1972) is slightly better. One of the biggest stars of his time (the prime of which was the late 1940s into the early 1970s), Kirk Douglas appeared in a surprising number of westerns. But many of them weren’t all that good, and in some of them his persona seemed to be fighting with the traditional western ways of looking at things. Like Burt Lancaster, he liked to not wear a hat, or to wear it only pushed back on his head. He experimented with especially tight and unlikely wardrobes (The Last Sunset, The War Wagon) which emphasized his robust physique and athleticism. He played a gunfighter who improbably only used a derringer (The Last Sunset). He didn’t really need the theatrical gimmicks, though. 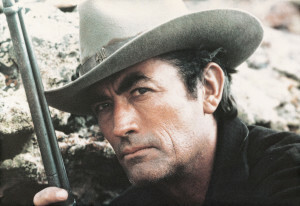 If you look only at his best work in westerns, you find one of the best mountain man movies (The Big Sky), his athleticism and physical strength (not to mention real acting ability) used to good effect without gimmicky costuming in Last Train from Gun Hill, the bitter edges of his personality being used effectively as Doc Holliday in Gunfight at the OK Corral, and as an isolated loner in the modern west in Lonely Are the Brave. 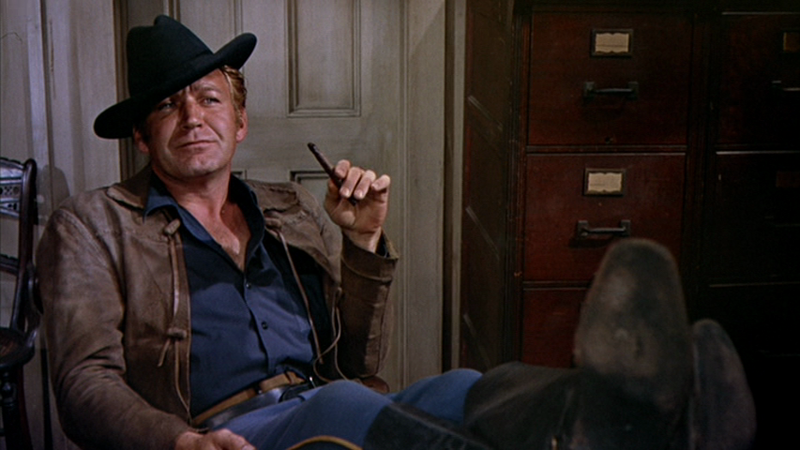 His ego was extraordinarily large (not unusual in Hollywood), but he managed to team well with Burt Lancaster (Gunfight at the OK Corral) and John Wayne (The War Wagon) when those two were in the dominant roles. As the 1970s came in, he starred in less effective revisionist westerns (There Was a Crooked Man, Posse), which would probably not have been made without him. In his last western, he chewed the scenery in dual roles in The Man from Snowy River. This entry was posted in Directors and Actors, Lists and tagged Burt Lancaster, Gregory Peck, James Garner, Kirk Douglas, William Holden on May 14, 2015 by Nicholas Chennault. This story takes place immediately after the end of the Civil War near Brownsville in southern Texas, on the Mexican border. José Esquedo (Anthony Quinn) is the leader of a large gang of banditos and outlaws, with whom the law in the area (Ted de Corsia) does not have the resources to cope. Esquedo’s right-hand man is his foster brother known only as Rio (Robert Taylor, with a lot of makeup, showy gun rig and leather cuffs). With the end of the war, military resources in southern Texas are being beefed up. King Cameron (Howard Keel) has bought up a lot of land in the area, and at the start welcomes his new wife Cordelia (Ava Gardner) to southern Texas. Esquedo and his men keep burning ranches to keep out ranchers, settlers and their accompanying law. Cameron stubbornly keeps rebuilding. Rio has met Delia and is apparently attracted to her, but he says and does nothing that would give that away. 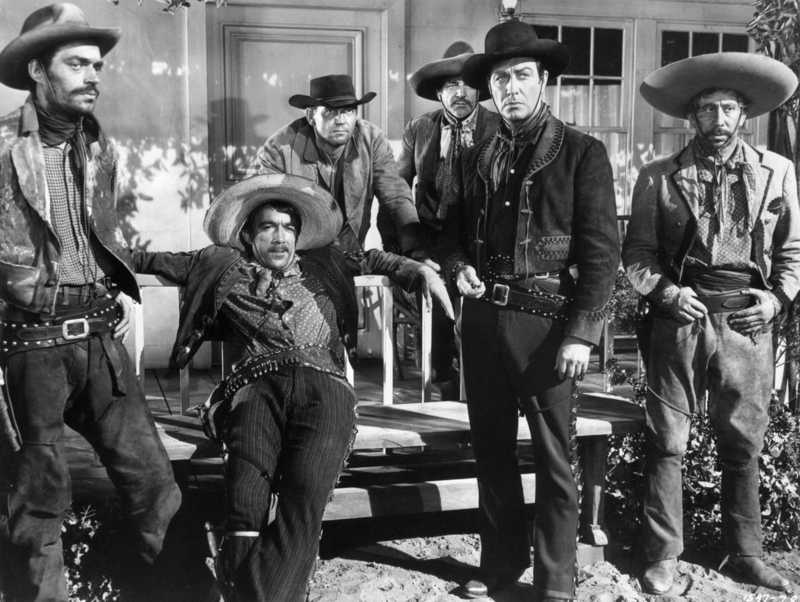 Esquedo (Anthony Quinn) surrounded by loyal retainers Barton (Jack Elam) and Rio (Robert Taylor). As the conflict between Cameron and Esquedo escalates, Rio is sent to burn Cameron’s newest ranch house, which is well-fortified. Before the task is complete, a cavalry unit shows up, and Rio and his men have to run for it. Pursued closely by Cameron, Rio’s horse stumbles and throws him. Captured by Cameron, Rio then promises to help him round up and bring back horses from Mexico in return for Cameron not turning him over to the law or shooting him. So the central conflict in the film is about Rio and his struggles with the ideal of loyalty. Rio keeps his promise, to the disgust of Esquedo. As Cameron leaves on an extended trip to purchase equipment, Rio is in effect his foreman. Delia insists on being taken to Esquedo to try to talk him out of his war with Cameron. Despite misgivings, Rio takes her. The meeting goes badly, but Esquedo allows Delia and Rio to leave; he’s sure that Rio will come to his senses and rejoin him if given time. Back at the Cameron ranch, Delia kisses Rio, and despite his attraction to her, he is horrified at her lack of loyalty to her husband, and he disappears. 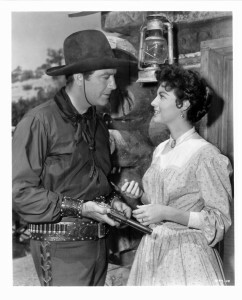 Rio (Robert Taylor) and Cordelia Cameron (Ava Gardner) get to know each other. And Esquedo (Anthony Quinn) takes aim. Finally Esquedo loses patience and takes over Brownsville with his men, killing the outgunned sheriff, looting the bank and local saloons. As Esquedo’s men hear of approaching cavalry, they begin to desert him. 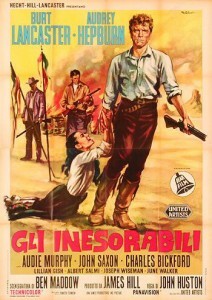 Cameron returns to Brownsville and stands up to Esquedo, although he can’t really match him with a gun. Finally, Rio takes on the increasingly irrational Esquedo in the saloon where he’s about to kill Cameron and demonstrates finally where his loyalty lies. 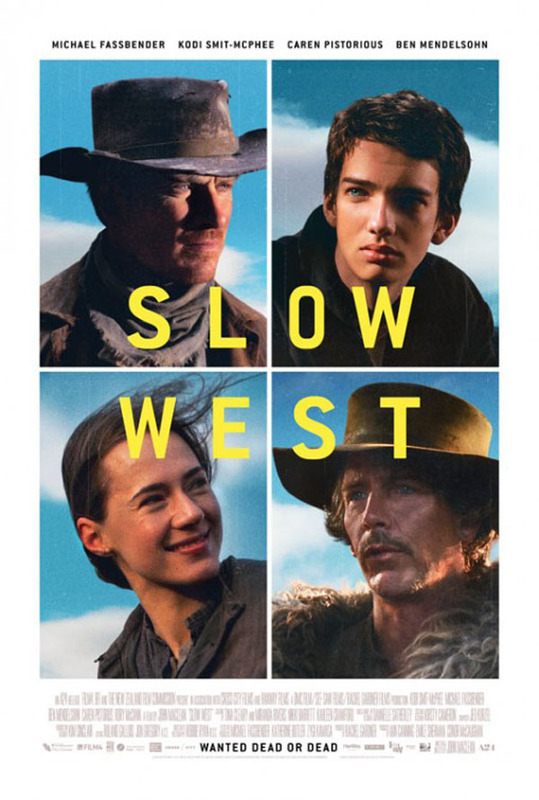 John Farrow was not really a great director of westerns. His best western, Hondo, was at least partially directed by John Ford. The other two, Copper Canyon and this, are flawed. Many of the women who worked with him, including Ava Gardner, seemed to despise him. Howard Keel was not really a terrific actor, especially when he wasn’t singing, but he’s not bad here. 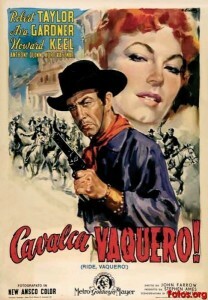 Ava Gardner made few westerns (just this and Lone Star the previous year); her part here seems underwritten. It’s pretty well known that director Farrow (married to Maureen O’Sullivan, with whom he had seven children, including actress Mia Farrow) and Gardner were having an affair during filming. 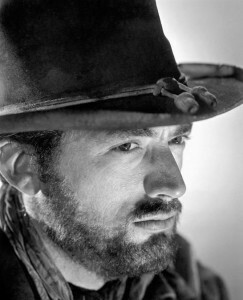 We know that Robert Taylor could be very good in the right circumstances (see Ambush and Westward the Women from about the same time, for example). But here he seems stiff and heavily made up, and his part as the conflicted Rio is not well written. Still, he manages to be interesting. 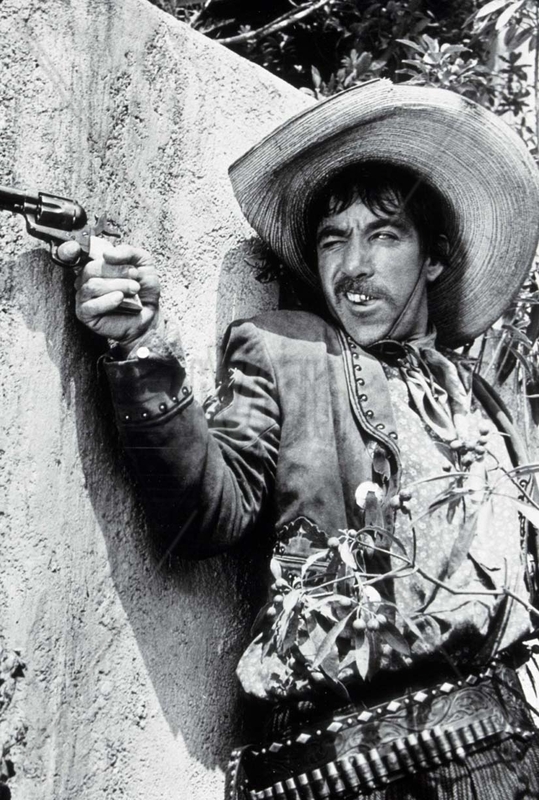 Anthony Quinn could be an excellent actor (Man From Del Rio, The Ride Back, Warlock), but here he chews the scenery as an over-the-top stereotyped Mexican bandit chieftain. Jack Elam is effective in one of his meatier (if brief) roles as Esquedo’s right-hand man after Rio leaves. Geronimo’s Apache-Mexican grandson Charles Stevens is one of Esquedo’s banditos. 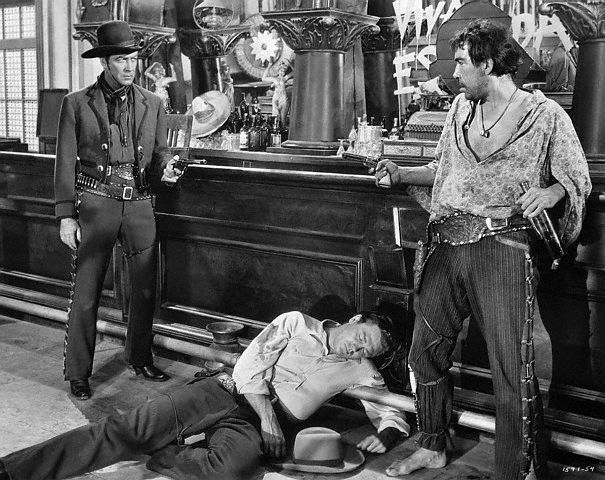 Rio (Robert Taylor) and a debauched Esquedo (Anthony Quinn) meet over a prostrate Cameron (Howard Keel). 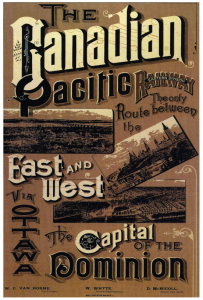 A considerable part of the weakness here is in the writing by Frank Fenton, who could do better (Station West, River of No Return, Escape from Fort Bravo, Garden of Evil). Still, it’s watchable as the enigmatic Rio works out where his loyalties will lie. For another character named Rio in a much worse western, see Jane Russell as Billy the Kid’s romantic interest in The Outlaw (1943). Shot in color by the estimable Robert Surtees near Kanab, in southern Utah, at 90 minutes. Music is by Bronislau Kaper. Like most other movies featuring a strong relationship of any kind between two men (Warlock, Butch Cassidy and the Sundance Kid and many others), comments have been made about a supposed homosexual subtext. If it’s there at all (and it’s doubtful), there’s certainly nothing overt. It becomes a lot campier if you start thinking about it in Freudian terms. 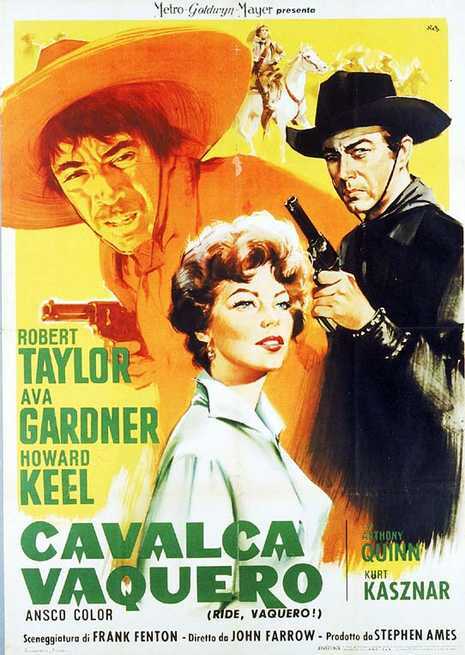 This entry was posted in Westerns Worth Watching and tagged Anthony Qinn, Civil War Aftermath, Robert Taylor on May 4, 2015 by Nicholas Chennault.